Literally, every time I think of Whitney Houston, I get sad. Her untimely death in 2012, though some may argue we saw coming for at least a decade, still devastates me something awful. When one of her songs shuffle to the surface of my iPod playlist, or while watching anybody else sing the "Star Spangled Banner" at the Super Bowl, I miss her profoundly. So, thinking of her has become synonymous with heartache and bewilderment over a beautiful and talented idol who withered away right in front of us. 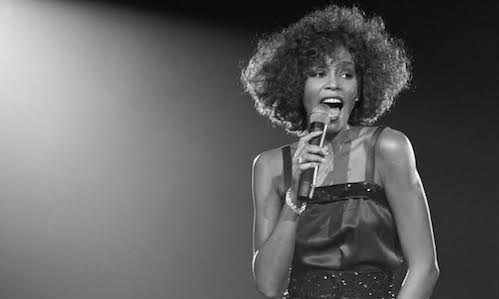 Naturally, WHITNEY: CAN I BE ME, a new documentary which premiered at the Tribeca Film Festival, is an equally harrowing narrative not only because it recounts Houston's once incredible voice and horrific demise, but shows the woman behind the talent; the deeply fragile, lost young starlet-turned-mother and wife. Though directors Nick Broomfield and Rudi Dolezal sometimes victimize Houston in the way media once did, highlighting her vulnerability and naivete often during those precious private moments and her rapid downward spiral of drug addiction of which she had no control, they are quick to couple that with interviews with those who spent the most time with her, including her bodyguard, hair stylist, and personal assistant—highlighting the complicity of those around her. There is an obvious dichotomy between how Houston saw herself and how everyone else perceived her. The film, however, does curiously work hard to dispel any notions that Houston's husband Bobby Brown introduced her to drugs. In fact, it mentions on several occasions in the years prior to meeting her future husband that she had overdosed or had been using. According to those in her entourage and who knew her from her New Jersey beginnings, this is something she struggled with personally, without anyone else's direct influence. Whether it was her severe insecurity, inability to navigate the pressures of the industry, gay rumors, or the crippling realization that her black audience thought she had betrayed her by becoming a pop star sellout, Houston made the decision to pick up a habit that completely enveloped her. Similar to Asif Kapadia's 2015 Amy Winehouse documentary, WHITNEY: CAN I BE ME is uncompromising, uncomfortable, and can definitely be considered exploitative. Especially given that the movie doesn't include any interviews with Houston's family or friends (noticeably, Brown's sister offers her own account in the film) and most of the interviews featured are picked up from other people's interviews (i.e. Diane Sawyer's 2002 interview with Houston and Oprah Winfrey's 2013 interview with her mother, Cissy Houston). Did she have any friends other than those that were on her payroll? Did her family not want any role in the project? Who is the person behind the camera, capturing all these personal moments? I bring this up to point out the overly crafted, manipulative narrative, which may or may not be intentional on the filmmakers' part. Still, it doesn't sit well with me. But the film remains a crushing profile of one of the world's most beloved stars, even if much of it relies on her darkest moments.